This week’s “Getting to Know” quick reference guide focuses on what the paddles are behind the steering wheel on some cars, and how they work. Paddle shifters are two levers mounted behind the steering wheel to allow drivers to manually change the gear of an automatic transmission, thereby enhancing user engagement. The paddle on one side shifts the transmission up a gear (normally denoted by a ‘+’ symbol), while the other side shifts it down (often indicated by a ‘-’ symbol). There’s no clutch pedal in order to activate the levers (sometimes called flappy paddles). Some models with paddles also have a manual mode “M” on the gearbox gaiter, where you can push and pull the lever to upshift and downshift. In simple terms, paddle shifters are essentially a set of electrical switches, activated by either pulling the right or the left paddle. This mechanism sends a simple set of commands to the electronic control unit (ECU) of the transmission to change gear, according to which paddle has been used. What are some of the advantages of having paddles? Many automatic transmission systems only change gears depending on speed, but many don’t recognise the actual driving conditions or terrain. Therefore, with paddles, a driver can take control of the gears when they encounter different driving conditions, which may require a different gear selection to maximise performance. Paddle shifters can prove effective when tackling hilly terrain or when towing a trailer. By shifting down when the car is on a steep incline allows engine braking to be increased which preserves the brakes and can prevent them from overheating. Control is also enhanced as the driver’s hands never have to leave the steering wheel when changing gear. Also, if it is difficult to gain traction in the snow, some paddles will allow the driver to upshift in order to help limit wheel spin. Where can I find a garage to buy a car with paddle shifters? 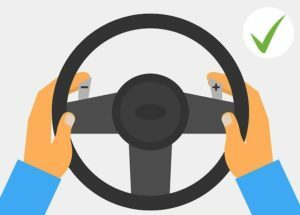 To find a garage that sells new or used cars fitted with paddle shifters, visit www.TheMotorOmbudsman.org/garage-finder.